The Humber is a North Sea inlet on the East coast of England and it is one of the major deepwater estuaries in the U.K. The deepwater channel is 22 miles (35 kms.) long from the open sea at Spurn Point to Kingston Upon Hull. Further upstream at low tide there are many sandbanks that are exposed restricting navigation to smaller vessels. 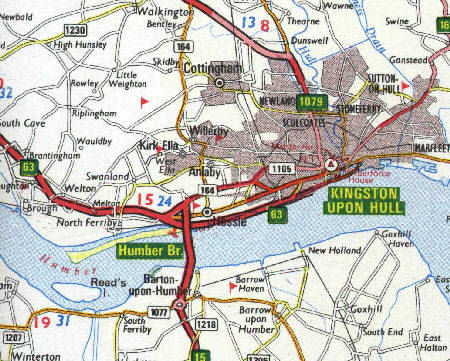 The Humber starts at the juncture of the River Ouse and the River Trent, and at this point it is approximately 1 mile (1.6km) wide. It increases its width until at its mouth, 37 miles (59 kms.) to the east, it is about 8 miles (13 kms.) wide between North Lincolnshire and Kilnsea, East Yorkshire with Spurn Head jutting out nearly 4 miles (6.4 kms.) into the estuary. The Humber with its canals and tributaries, (which include the rivers Hull, Ancholme, Derwent, Ouse and Trent) run off an area of 9,550 square miles (24,750 square kms. ), which is about 20% of the total land area in England. This provides the largest single output of fresh water from Britain into the North Sea. The Humber is a large tidal estuary and extremely turbid, the estuary has a brown appearance due to this high turbidity, and is often thought of as a dirty river. This is not so, the Humber is healthy and there are many Nature Conservation areas and important Nature Reserves in and around it. The waters of the estuary are heavily laden with sediment, which comes from marine and riverine sources and the eroding boulder clay of the Holderness coast. This sediment keeps extensive inter tidal flats and forms mud and sand bars that make semi-permanent islands along the shores, sand dunes and small lagoons can also be found. At low tide vast expanses of mud flats are exposed. These are one of the Humbers important habitats for millions of invertebrates, that provide a food source for many other species. Further upstream as the salinity decreases extensive reed beds fringe the estuary. Therefore the estuary supports a vast collection of wildlife and natural habitats from salt marsh and samphire beds to sub tidal sandbanks and many species of fish, birds are also a well known feature of the Humber, with many species of International importance using the Estuary. The great width of the river had for many years prevented unified economic development between both sides of the river. This was one of the reasons a bridge was mentioned and planned. The bridge had been an idea for the area at least 100 years before it was finally planned and built to help stimulate industrial and commercial growth in the area. It was built 5 miles (8 kms.) to the west of Hull between Hessle and Barton on Humber. This map shows the location of the Bridge and the area around plus the road approaches from the North and South. Now economic activity around the Humber includes Industrial complexes such as:- Chemical Works, Power Stations, Wind Turbine Industry, Oil Refineries and the combined ports in the estuary handle (which include Kingston upon Hull: Grimsby and Immingham) around 14% of the U.K.'s International Trade. The inland port of Goole (which is approximately 45 miles (75 Kms) inland) on the River Ouse, owes it's growth to the formation of the canals, while the original growth of the major ports was mainly due to the railways.